The Brazilian had to sit an exam in North Wales. I tagged along too, and left to my own devices for a whole morning I paid a visit to Bodnant Gardens. 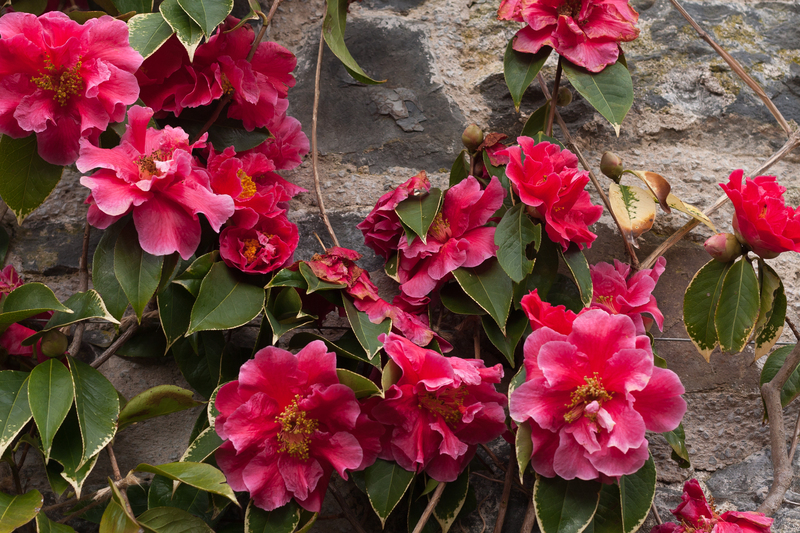 … and Bodnant, about 230 miles south of Edinburgh, is a good two weeks ahead of my own garden. 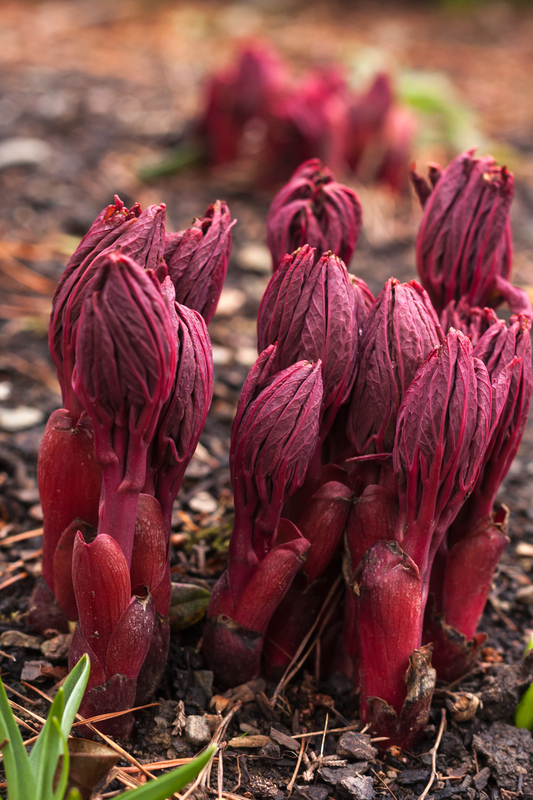 Our own peonies are mere red tips barely peeping from the ground. 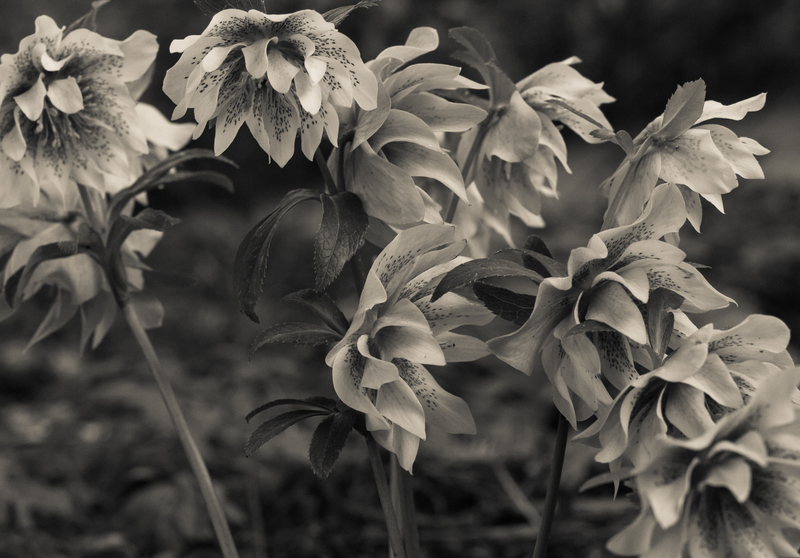 Hellebores of every colour, type and marking, maintained centre stage in the Winter Garden, now that the snowdrops are mostly over. Have you seen a more venerable H. argutifolus than this? 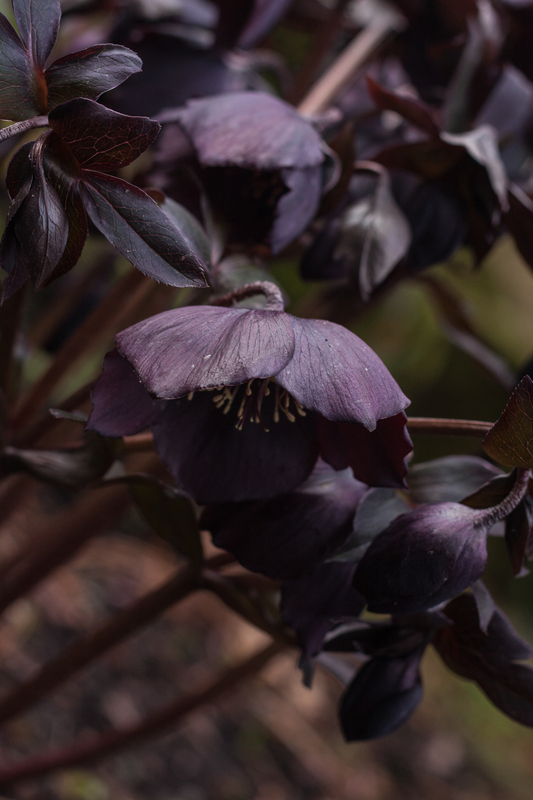 This wickedly glamorous night-black ‘Harvington Smokey Blues’ will certainly find its way to my garden. 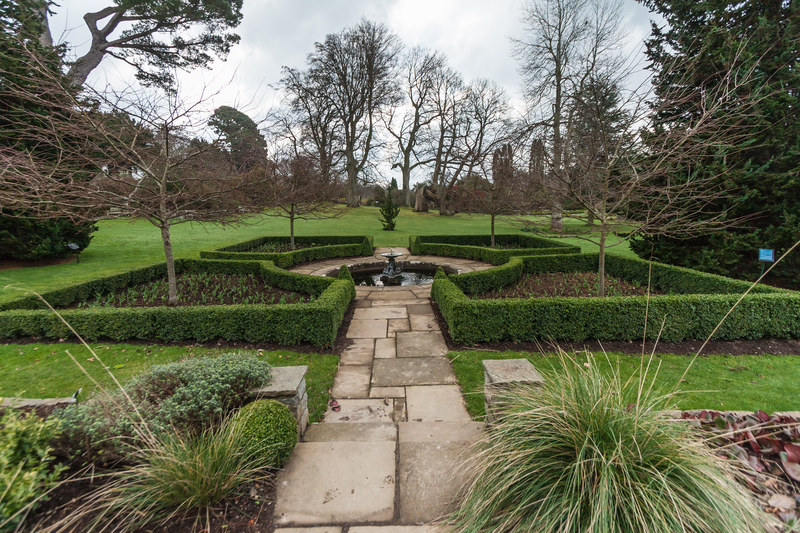 Bodnant is a place where tight structure meets beautifully with artless arrangement. 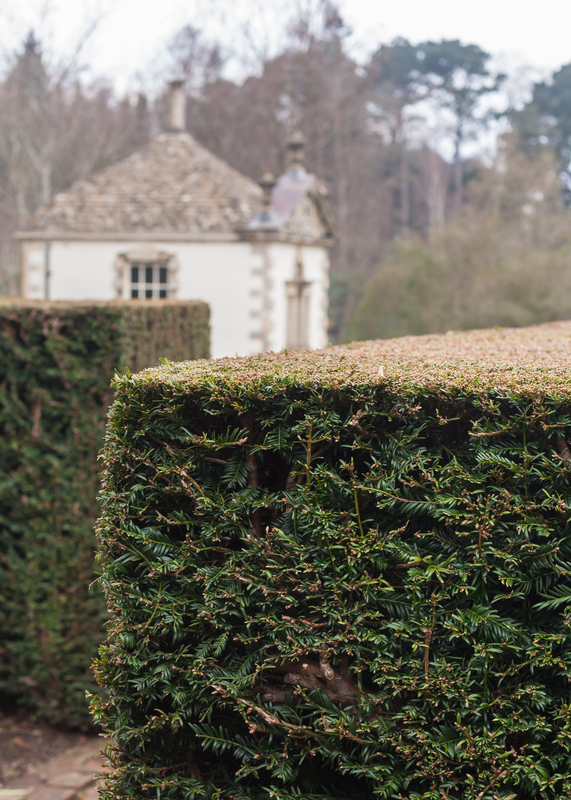 Impossibly tightly clipped hedges mark out grand terraces, formal lawns, rose gardens and mysterious paths. 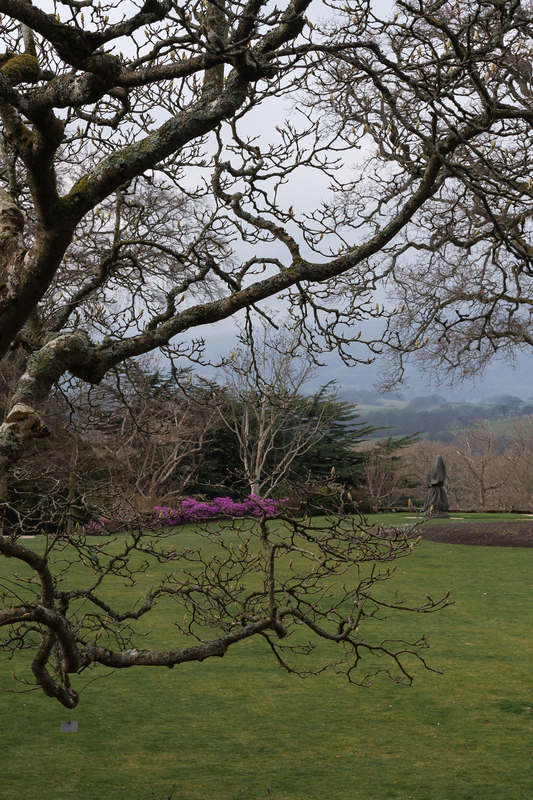 As with all the best gardens, Bodnant’s mixture of botanical textures was educational. Glossy bergenias of several types caught my eye, as they had in the Botanics a month ago. 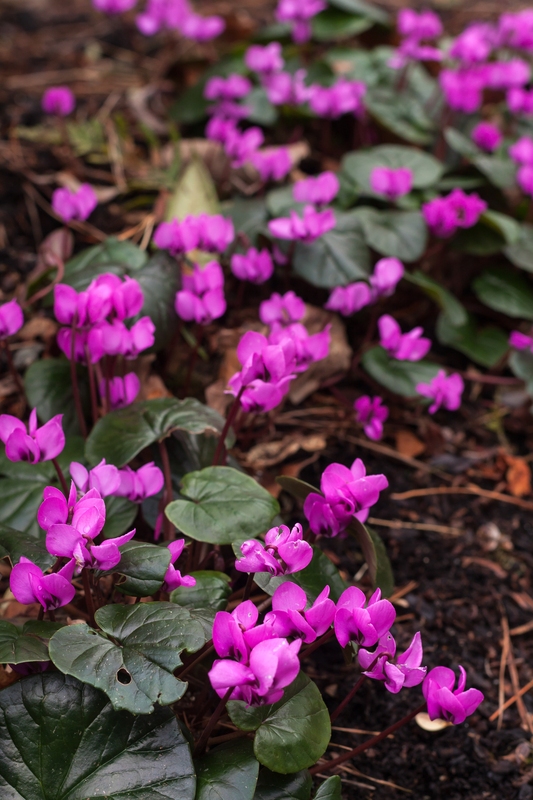 I’m too used to the depressing, desperate little cyclamens more usually found dessicating in supermarkets and on petrol-station forecourts, so I’ve been somewhat slow in seeing much aesthetic merit in them. Yet who could fail to be charmed by the sight of healthy, naturalised colonies like this? 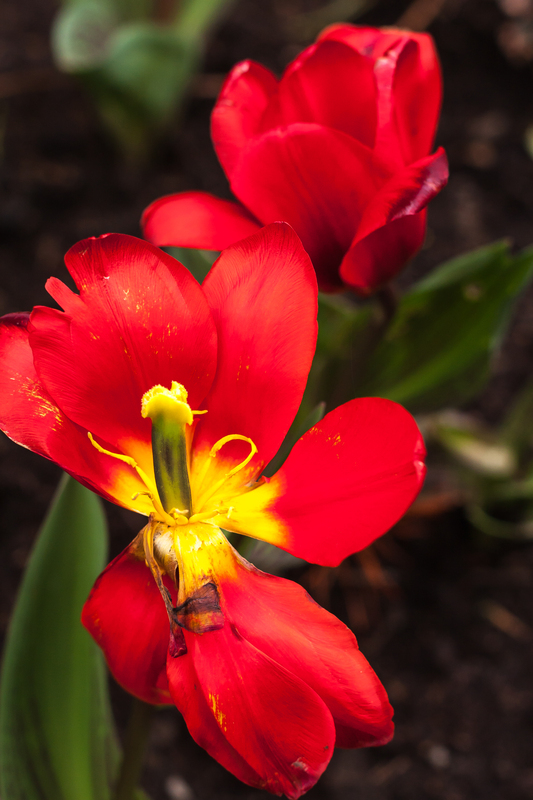 Tulips were springing up everywhere. None were in bud yet, save this exceptionally keen ‘Show winner’, which in fact was so keen as to be more or less over. And once more from the top. And whoops! Another ‘Show winner’, not for resuscitation. More ‘Show winners’. 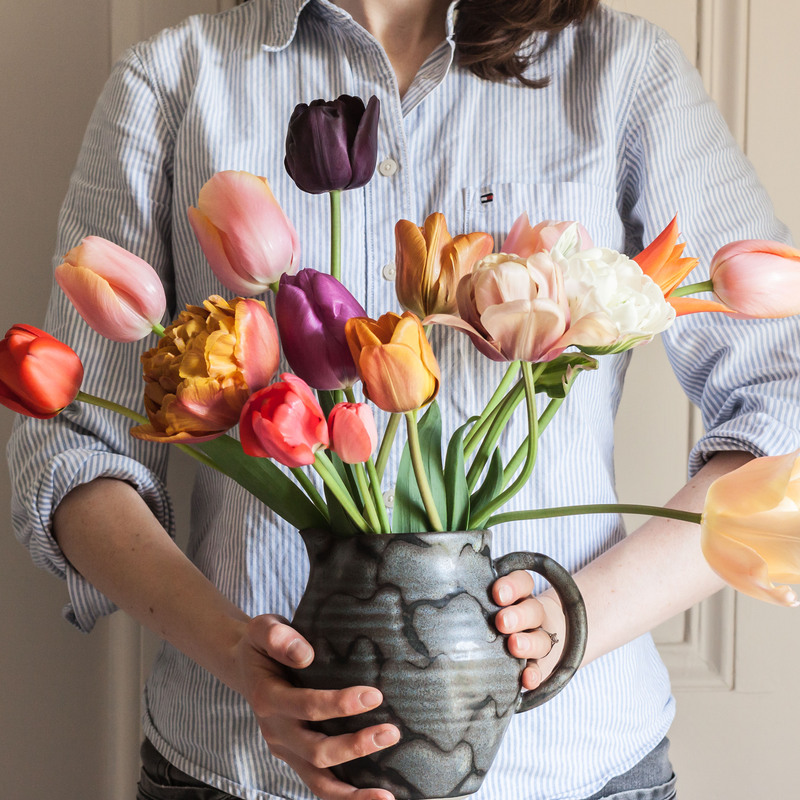 I adore tulips, but my own are barely green tips. I am positive they shrink back down into the ground if they don’t like the weather that greets them when they poke their noses out. 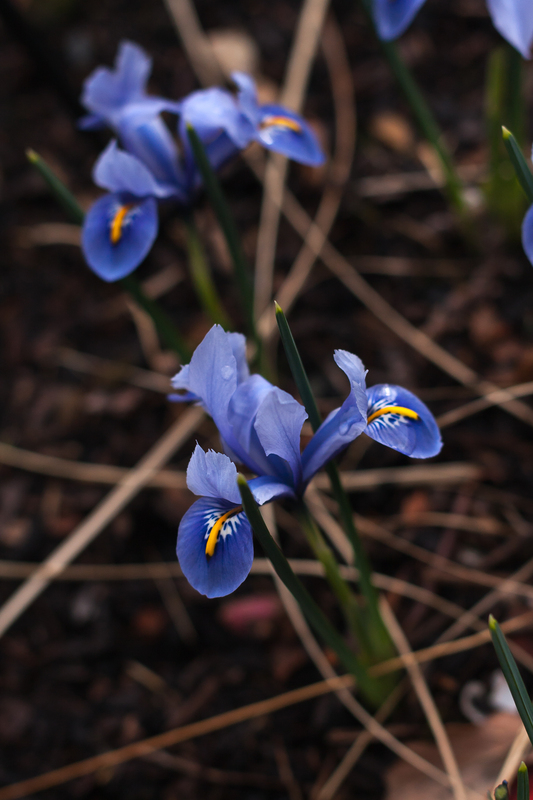 Iris ‘Alida’ were just one of several types of iris. 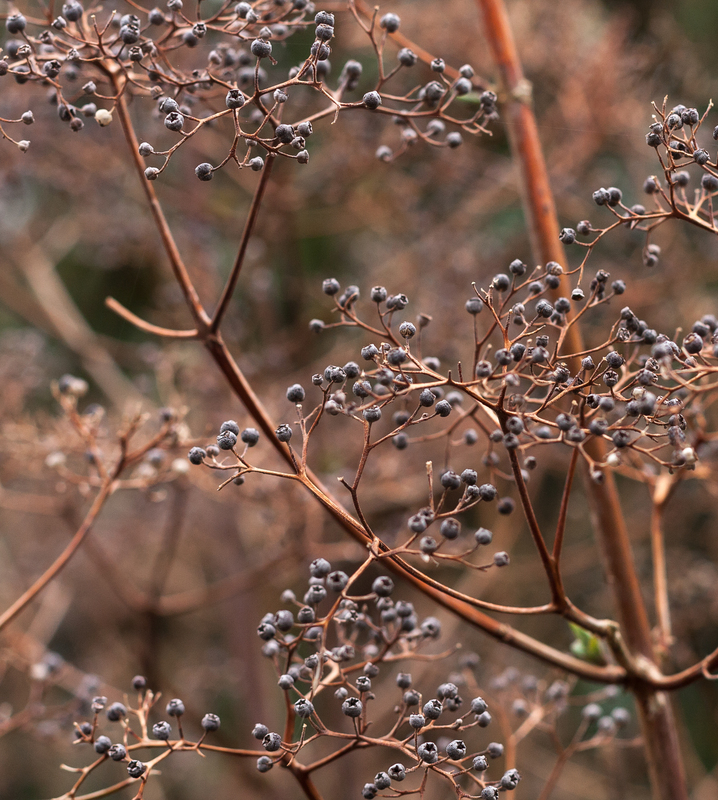 The lacy intricacy of Deutzia seedheads. With so many gorgeous plants and flowers it was important to remember to look up and take in the wider view. It was a hazy day, and the distant Welsh hills could just be seen. Bodnant is huge at 80 acres. It was easy to get lost (bliss). There was evidence that a great deal of new planting was under way. 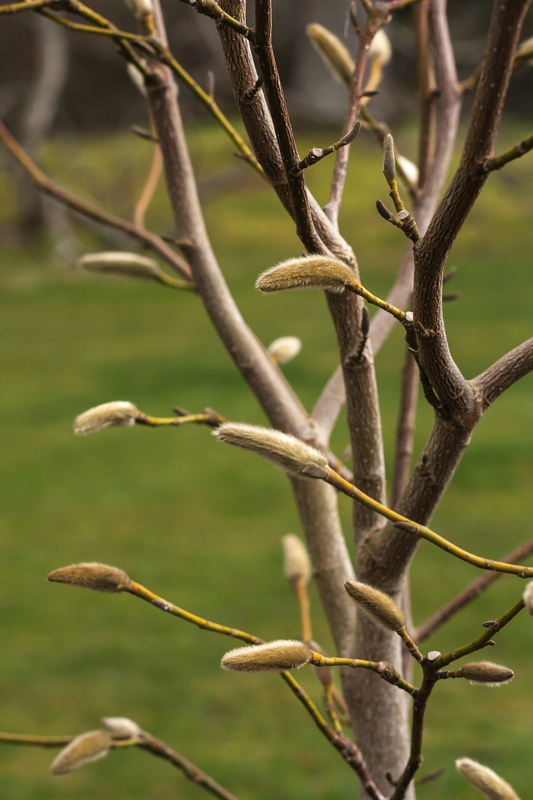 This Magnolia ‘Wada’s Memory’ was very young. 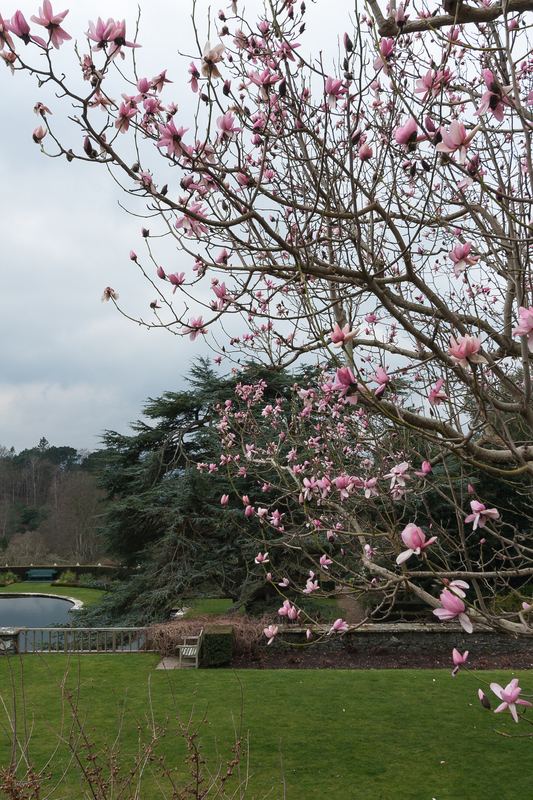 And a somewhat more established magnolia, looking out across the five Italianate terraces. The Pin Mill stands at the end of the canal terrace. Mature cedars stand like deities across the terraces. This round pool is on the upper level, from which water flows steeply down to the dell and the gorgously babbling River Hiraethlyn. Ah, happy memories! 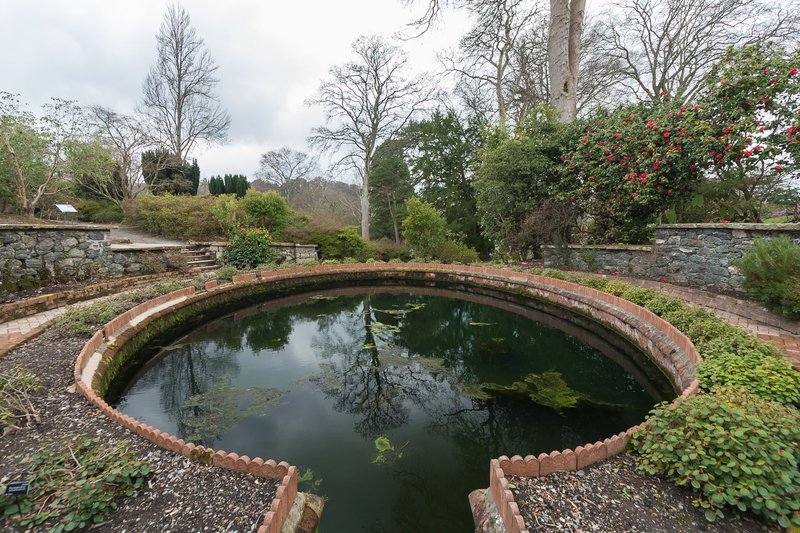 But not of that round pond, which is a bit of Bodnant I’ve never found. Next time I am allowed to go there I’ll look for it. 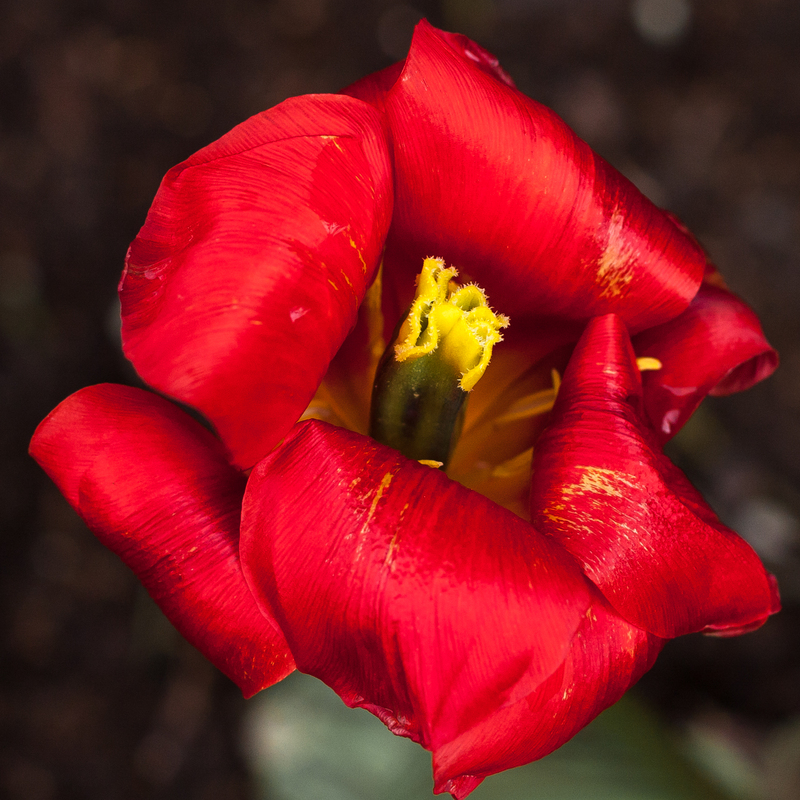 Show Winner is a kaufmaniana tulip. They are stumpy, and very early flowering, which is why they are almost over now. 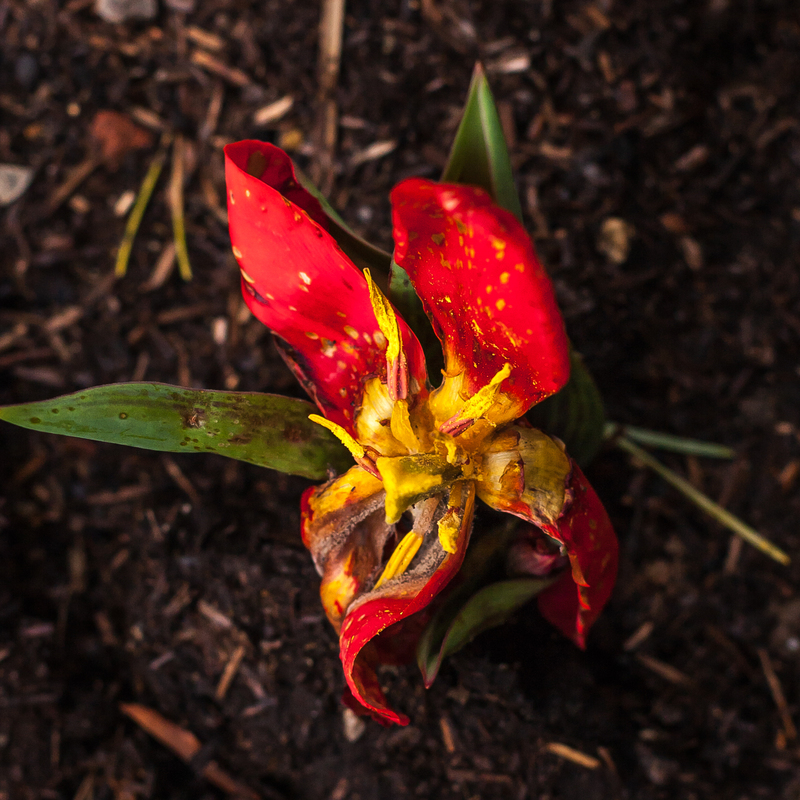 I love those little early tulips, and planted some last autumn, but have only two flowers, the rest were spoiled by evil slugs. 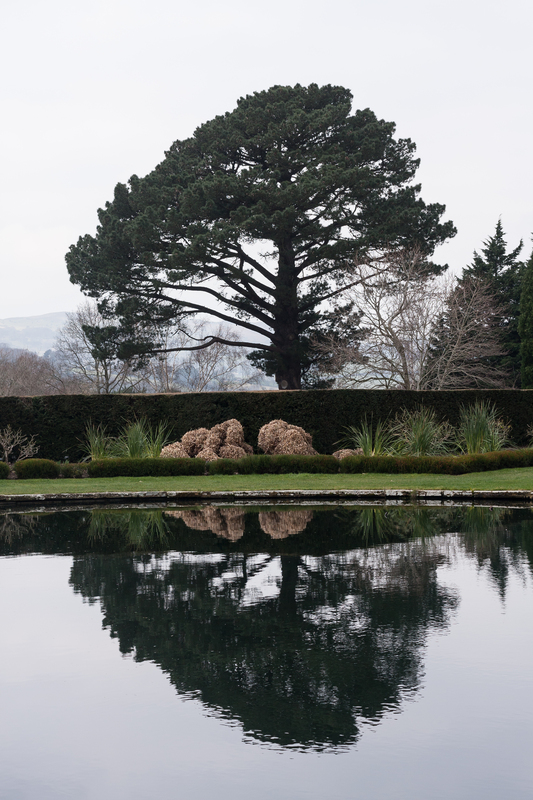 The magnificent cedrus atlantica glauca, which you can see beyond the mature magnolia, is a most noble tree. Lovely garden. 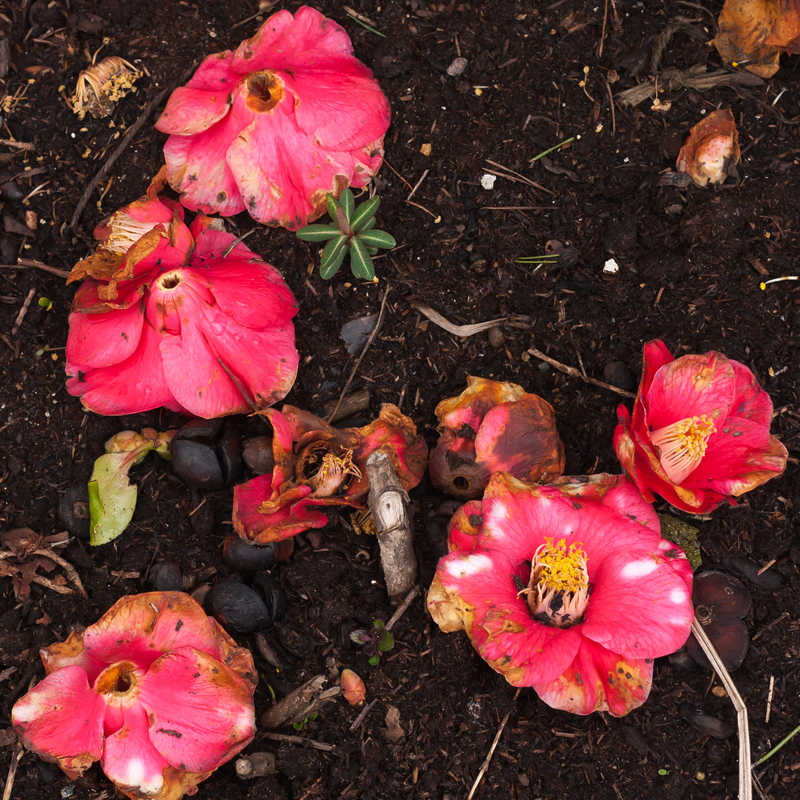 My own peonies are still sleeping underground. That cedar makes me understand why our distant ancestors may have worshiped trees. I really enjoyed the photography in this post, especially the reflections. You have captured things really well to give us a feel of the place. 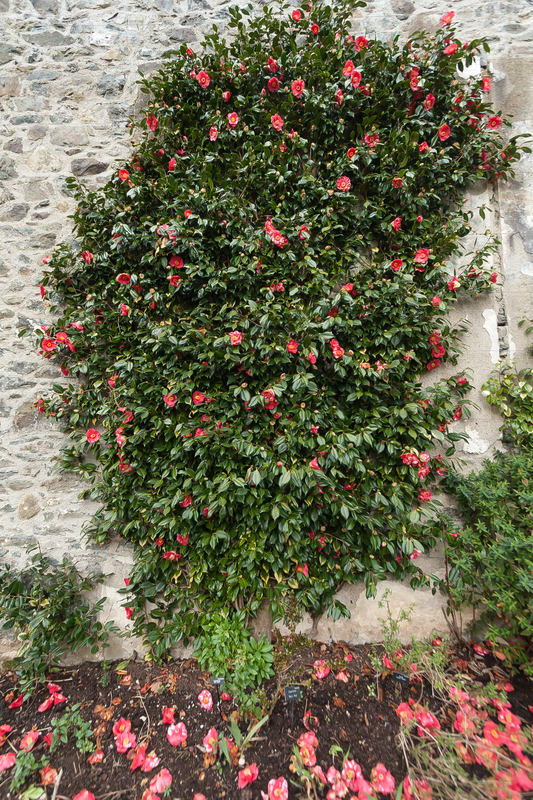 I loved the little row of camellia blooms on the wall (that reminded my of something you might see in Japan). I too have made a note of Harvington Smokey Blues and have already established that Crocus and Waitrose are selling it for £13.49. 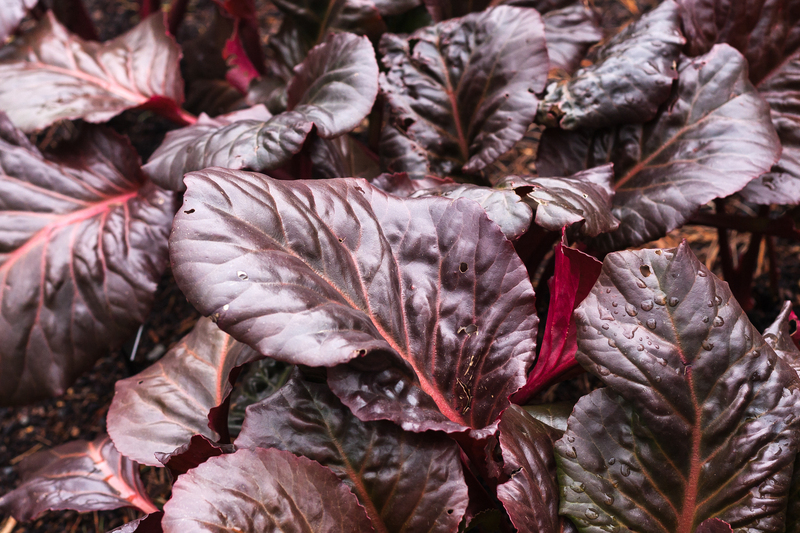 It is supposed to prefer an alkaline soil though so it might not like it here as we are slightly acid. 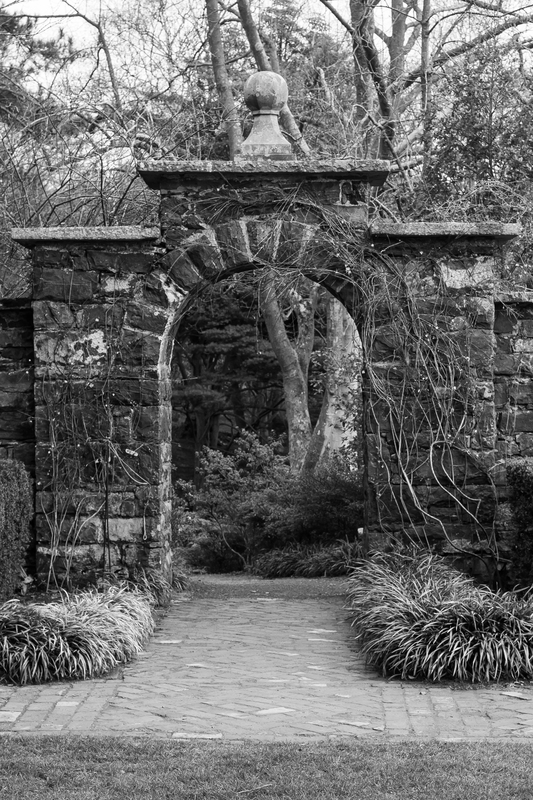 Two things I must remember to do – take more black and white photos – or at least convert more of them afterwards and take the bigger view instead of just close ups. Thanks for reminding me. I saw that Smokey Blue on Waitrose too! It’s waiting in my ‘Wheelbarrow’ right now, although I agree it may not like our acid soil. 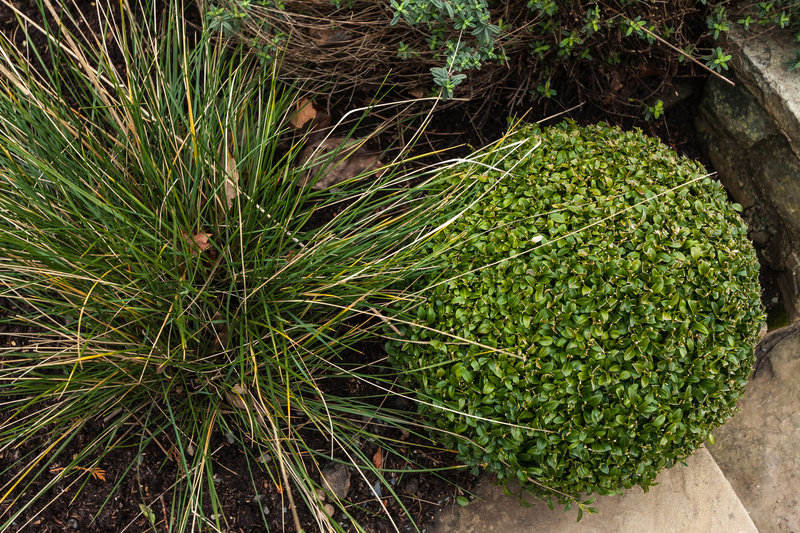 We could always lime the soil when planting? 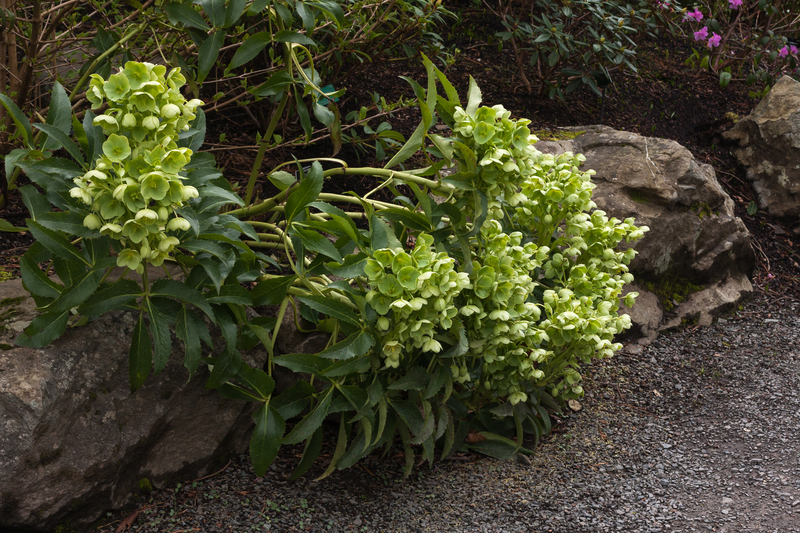 It was doing splendidly at Bodnant in the same soil as their trillion rhododendrons, though we’d never know if the gardeners there treated the soil for either plant first. I think Bodnant has acid soil. 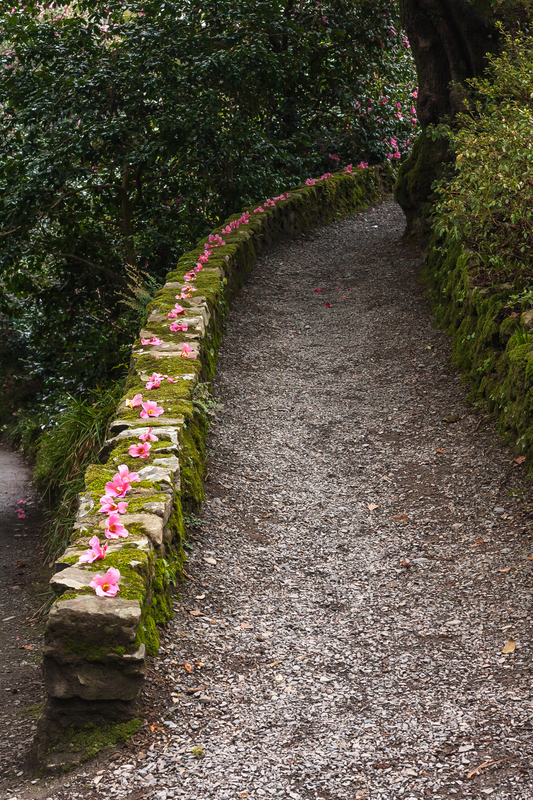 They have masses of camellias, rhododendrons and blue hydrangeas. I will be interested to see how you get on. Sometimes things aren’t as fussy as we are led to believe. A technical question if I may? In the WordPress reader your photos appeared as a gallery, but on your post they were just added to the text. Was this because you chose a special type of post? I am looking around for other templates so my photos can be shown a bit larger than on my current blog. I am rather terrified of making a change though in case the whole thing breaks. I’m afraid I’m probably not the best person to ask about that! I do know, having used several, that different themes can be very different to manipulate to one’s needs. I know what you mean about the scariness of changing theme, but I do believe you can test the theme with your blog and see how it behaves before committing. Yes I have tested a few and I think it would need some things changing after switching, like redoing menus etc, but that wouldn’t be too bad. One day I might take the plunge. Oh I have just worked it out! Your whole post was a gallery and the text was just captions. Clever! Hope you don’t mind if I copy that – maybe the images would appear larger than on a normal post. Of course I don’t mind! When you edit the photo, just press ‘Full Size’ or at least ‘Large’ in the drop down box, and centre it, and that should do the trick. Thanks – I might give that a try next time I have some good photos and not too much to say – hmm that doesn’t happen too often I’m afraid! 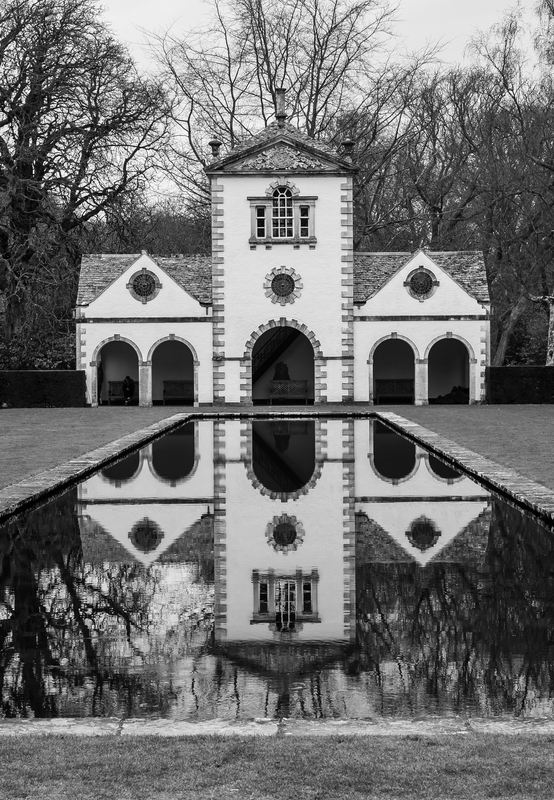 I’ve never visited Bodnant, I would really love to see it after reading your post. Fabulous images too, thank you. Thank you. Yes, do try and go if you get the opportunity. 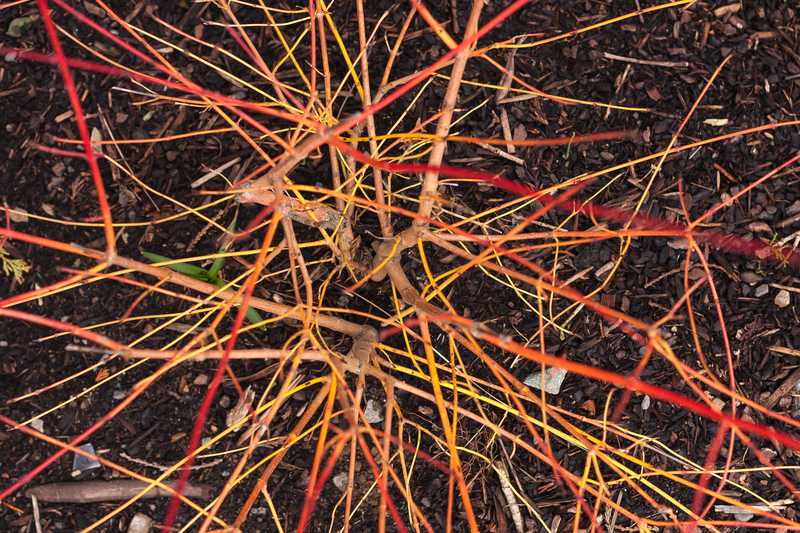 I have seen photographs of it in summer and it’s even more of a sight to behold than in cold March! Yes, I really must go back in summer!